AS BANKERS, Mr Reuben Low and Mr Alistair Foo were well on their way to a high-flying career and promising future. But they decided to take a break from work to pursue further studies, signing on for the year-long Master of Business Administration (MBA) programme at the University of Oxford's Said Business School. 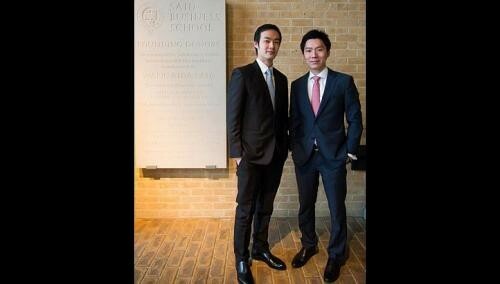 That decision proved a winning one for the two Singaporeans, who recently bagged the Oxford BNY Mellon MBA Achievement Awards for responsible and effective teamwork. They were among 10 winners overall, who were selected by an awarding committee after a round of nominations by fellow MBA students. Each received a cash prize of £500 (S$1,054). The perks from going back to school are more than just cash prizes, however. As part of their MBA programme, Mr Low and Mr Foo also had the chance to pick the brains of bosses of major global businesses such as private equity giant Blackstone, and to rub shoulders with elite Olympic rowers. Speaking by phone from Oxford, Mr Low, 27, said: "We have met lots of CEOs of large companies. The other day, Stephen Schwarzman, Blackstone CEO, came to have lunch with us. There are few places where you could get this kind of experience." To attend the programme, the economics graduate from the University of Queensland is on sabbatical leave from his investment banking position in Australia. Oxford was his choice to get a different perspective from the banking industry. "It is a very international class, compared with the US, where the majority are from within the US, or consulting or investment banking, and I wanted to be part of a more diverse class because I was already surrounded by bankers all day," Mr Low said. One aspect of the MBA course he particularly appreciates is the diversity of the students and the sense of teamwork among his classmates. "The class is like a big family, everyone helps each other out," he said. "I come from a finance background, and as a lot of the MBA students are trying to get into finance, I would try to help out with any finance or accounting questions in class." His schoolmate Mr Foo, 29, who studied commerce at the University of Western Australia, decided to further his education after working in corporate banking for four years. "I was at the point in time of my career where I needed to make that progression," he said, adding that he had "a personal ambition to pick up critical skills and tap on the network of the school as well". Mr Foo highlighted unique topics covered in the course, including demography and big data, "besides the academic rigours for which Oxford is known". He also noted that regular discussions and constructive feedback with like-minded, motivated fellow students were also highly encouraged. And as the Said Business School is part of prestigious Oxford, the MBA students also get to enjoy what the university has to offer on the whole. For example, two weeks ago, Mr Foo attended a talk by retired United States Air Force general Michael Hayden, the former director of the Central Intelligence Agency and National Security Agency. Other interesting talks include those by social entrepreneurs trying to distribute energy. "There is a wide variety of influences and people here," Mr Foo said. "Every week, we are meeting political leaders, billionaire entrepreneurs and even wrestlers." The two students have also rediscovered the joys of university life. Mr Low spends his spare time on football, and on the Oxford business network for finance as the investment banking vice-chair. He said that as an undergraduate, academic results were his top priority. Thus, he worked at internships during each school break, and "never got a proper holiday". "In Oxford, there are so many activities that really add value, so I feel like if I don't get involved, I am really missing out," he said. "I organised an event about investment banking last week, to tell students about what investment banking is and how to do well in your internships and interviews." The MBA will pay off in the long run, said Mr Low, who is not expecting immediate returns. "It will be beneficial not only because I have an Oxford MBA on my CV (curriculum vitae), but because of the things I have learnt through this experience, about myself and other industries, and how to deal with people all over the world," he said. Mr Foo, for his part, spends his spare time playing badminton on the University of Oxford squad, and also with his wife and eight-month-old son. He said: "I am also taking the time to reflect and find out what it is in life I would like to achieve. It is a work in progress." For now, he is enjoying his time soaking up the full Oxford experience. "Being here in Oxford, the kind of people that you meet and the energy that they have is very infectious, there is a sense of urgency, and we try to take the initiative to solve global issues," he said. "When you get to be in the presence of people of such calibre, you can't help but be inspired, so you set aside time for that."